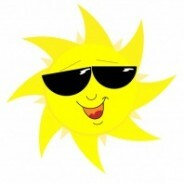 Come join us for a summer of fun at St. Justin School! 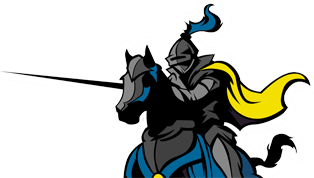 Two camps, Super Chargers Summer Camp and Kinder Readiness Camp, will be available to incoming students in grades K – 5 from June 17 – July 26. Extended Care will also be available from June 10 -14 and July 29 – August 2. To sign up, please visit https://goo.gl/forms/KJZi4FGOnkiN6jjI2 We hope to see you there! It’s Catholic Schools Week! The school was all abuzz on Sunday between Open House and the Book Fair! 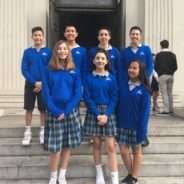 On Monday 8th grade representatives from Student Council celebrated mass with the rest of the Diocese of San Jose Catholic Schools at the beautiful Cathedral Basilica of St. Joseph. During the rest of the week, we have designated days celebrating our parents, teachers, and students. There’s never a dull moment here at St. Justin School! 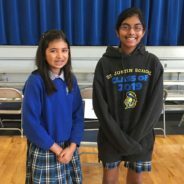 Every year, St. Justin School participates in the Scripps National Spelling Bee. 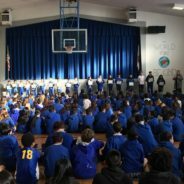 This morning, the entire school gathered together to support the 18 participants from grades 3 – 8 who earned the top positions in their class-wide spelling competitions. 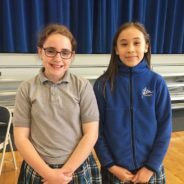 After 14 spellbinding rounds, Melissa Orlando (6th grade) was declared the winner with Anais Desbieys (7th grade) taking the runner-up position. Congratulations to all of our Spelling Bee participants! We applaud their their hard work, courage and determination!